After you’ve removed the old strings and cleaned the fingerboard, it’s time to restring your bass guitar with brand-new strings. 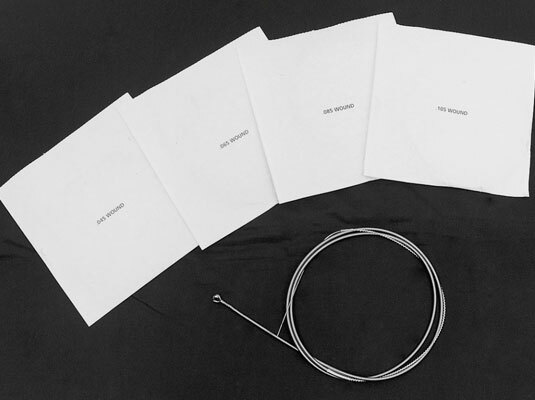 New strings are usually coiled in envelopes. The envelopes are numbered according to string size (the thickest string has the highest number). 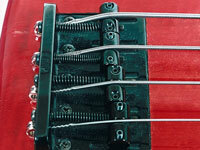 With most electric basses, the new string has to be pulled through a hole in the bridge. Make sure your wire cutters are nearby when you restring your bass. You’ll need to cut the new strings down to size. 1Lay a towel down in front of you and lay the bass on the towel, with the neck pointing to the left (to the right if you’re left-handed). The towel will keep it clean and help keep it from sliding around as you work on it. 2Take the thickest string out of its envelope. Notice that it has a ring (called a ball) at one end; the other end is pointed, with its tip wrapped in silk. 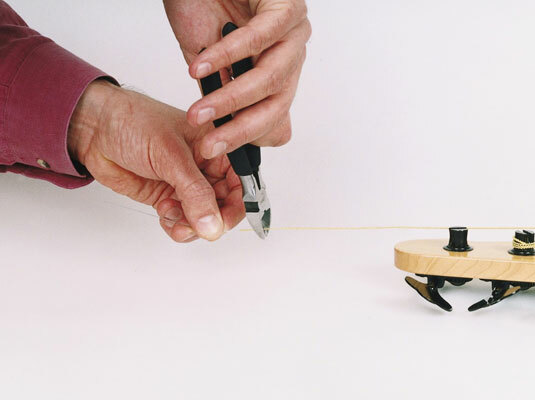 3Straighten the string and push the pointed end through the hole that’s nearest you on the bridge. Each string goes into a separate hole. Pull the string through the hole toward the nut. Make sure that the ball at the end of the string comes to rest against the bridge. 4Pull the string until it’s resting against its designated tuning post. The post has a groove crossing the top and a hole in its center. 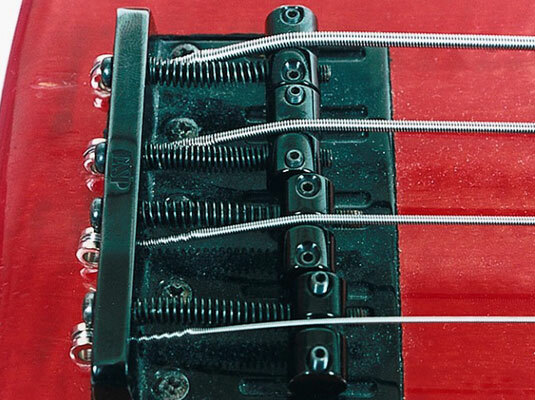 Make sure that you have enough string to extend 4 to 5 inches beyond the tuning post. This extra length ensures that your string is long enough to wind several times around the tuning post (so the string doesn’t slip when tightened). 5With your wire cutters, cut off any excess string 4 to 5 inches past the post. Cut only from the part of the string that’s wrapped with silk. Never cut the thick part of the string itself (the metal). If you cut this part of the string, it will simply unravel. 6Stick the tip of the string straight down into the hole in the center of the tuning post. Then bend the string to the side so that it rests in the groove at the top of the tuning post. Hold the string in this position with one hand. 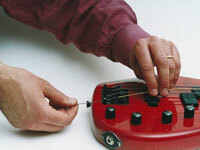 7Turn the tuning head with your left hand to increase the tension of the string. 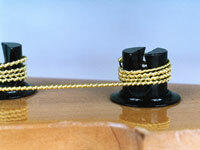 Make sure that the string winds down the post (you can guide it with the fingers of your right hand). 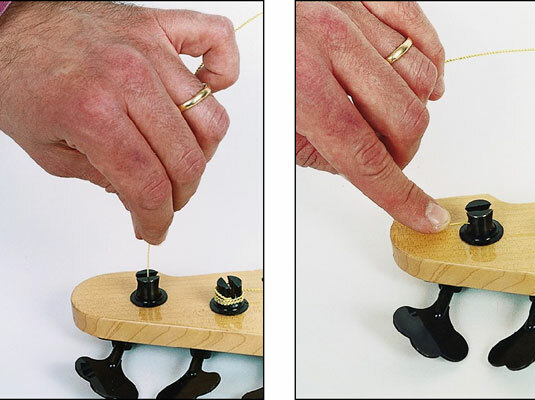 This downward winding increases the slight bend of the string against the nut and ensures that the string sits firmly in its groove on the nut, giving the notes better sustain. Turn the tuning head to wind the string up. 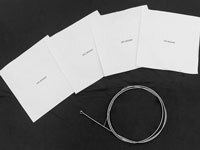 Don’t wrap the string around the tuning post by hand; if you do, the strings will twist and lose their ability to sustain notes. 8While increasing the tension at the tuning head with your left hand, use your right to make sure that the other end of the string stays in place. Each string has a specific saddle it must lie in at the bridge. 9Repeat the entire process for all the other strings, from thickest to thinnest. Some basses have string retainers that hold the two thinnest strings close to the headstock (the top part of the neck). Pass the two thinnest strings under the string retainers before tightening them. 10Tune up the new strings. You’ll need to go through the tuning process several times, because the new strings need to stretch out and the neck will bend forward under the increased tension.